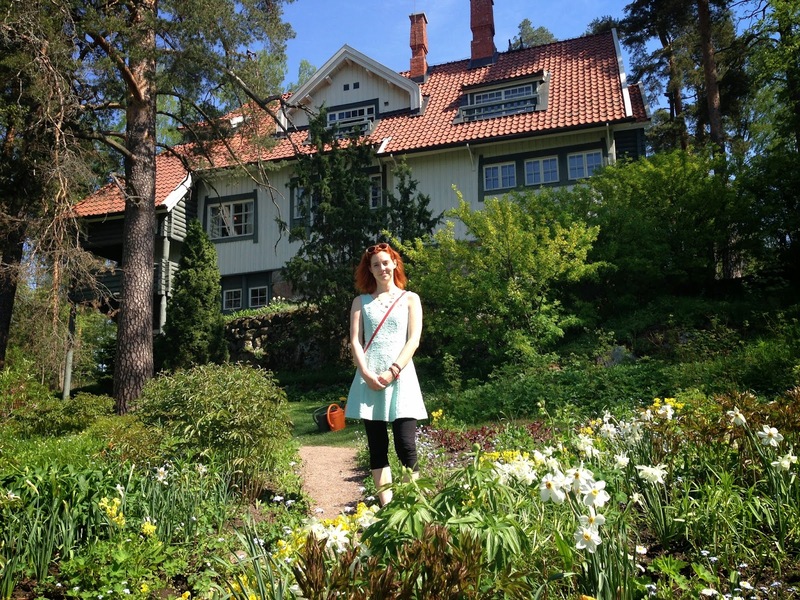 Yesterday, I finally got to visit Sibelius' home Ainola, which is named after his wife Aino. I had heard about it since I moved to Finland last July, but was waiting for the perfect spring day to visit. 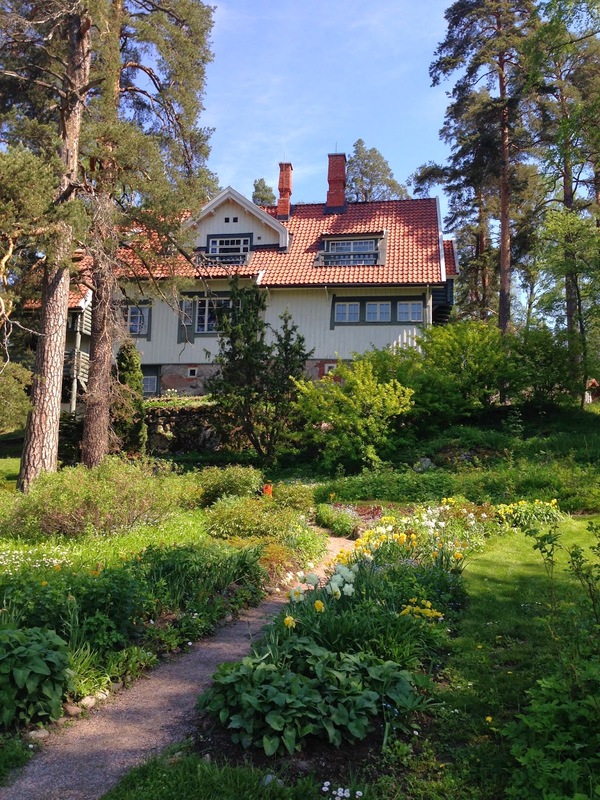 We are all so fortunate to have such a well preserved home and museum to visit and become even more inspired and intrigued by the great Jean Sibelius. I really wish that every composer had a place like this for us musicians to visit. I visited Bartók's house in Budapest in the summer of 2012, and much like my visit to Ainola it left me feeling so much closer to its former inhabitant. Sibelius had synesthesia, and perhaps this is why all of the fireplaces in his home are such beautiful rich colors. 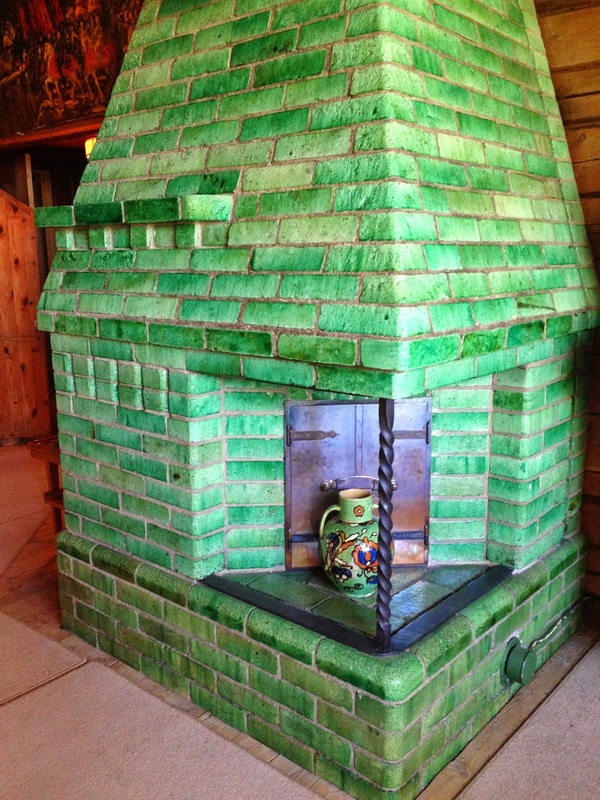 I fell in love with this green fireplace in the dining room. I love the way green makes me feel (especially blue/green), but I definitely do not have synesthesia. I wonder what this green color meant for Sibelius. 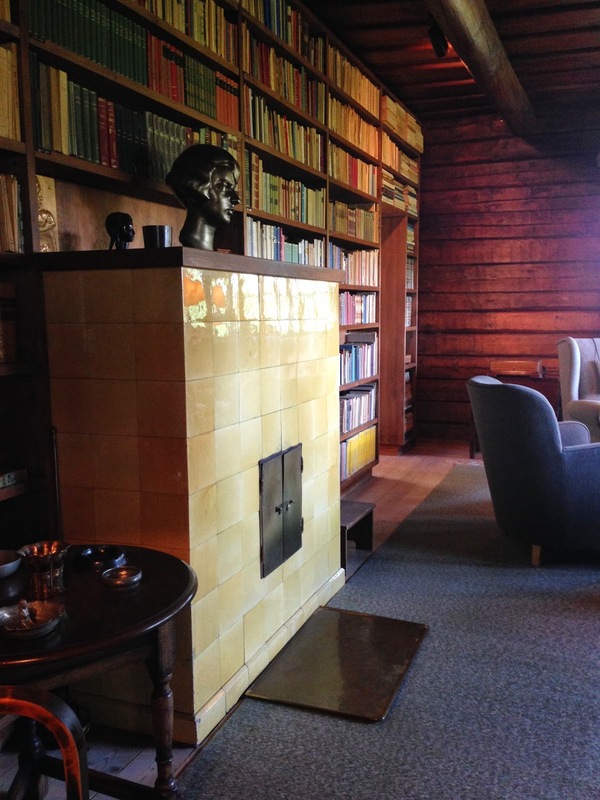 He also had a lovely yellow fireplace in his library, which used to be a bedroom for one of his girls. The library was such an enchanting room. I so badly wanted to step over the rope and get lost in all of his books. They looked so well loved, with the spines all broken and yellow. It was such a "man's room," with a circle of comfortable chairs in the corner perfect for cigar smoking and whiskey drinking. 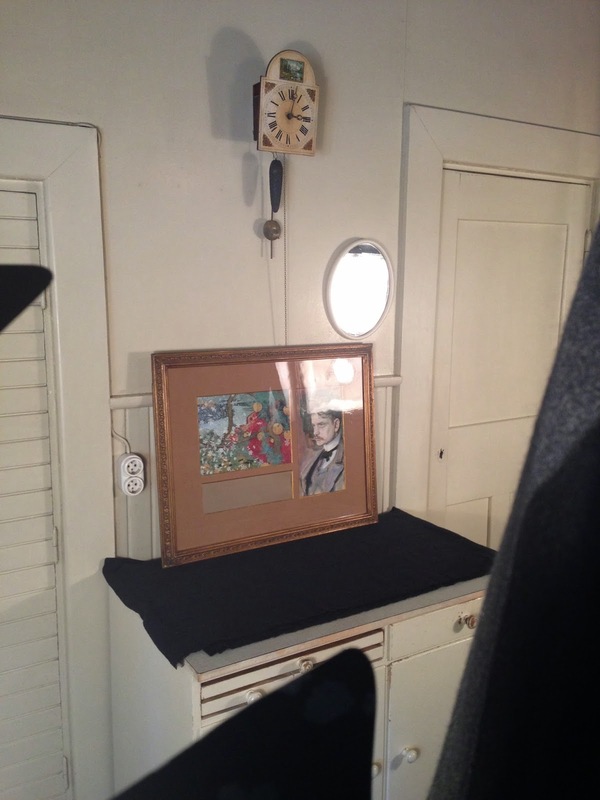 The kitchen was off limits for most of the time we were at Ainola because there was a photographer taking pictures of the famous portrait of Sibelius. I did not realize how small it is in real life! Such a beautiful portrait. The kitchen is very different from the rest of the house. With some interesting gadgets, but a much different feel because they kept a housemaid or two, and I'm guessing they did not spend much time in the kitchen themselves. 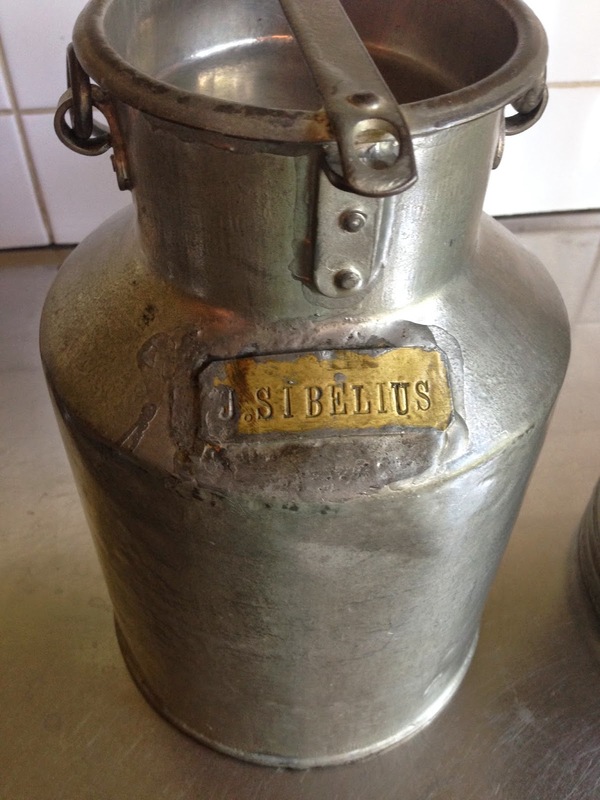 I loved this metal container with "J. SIBELIUS" stamped on it. It is so rustic! 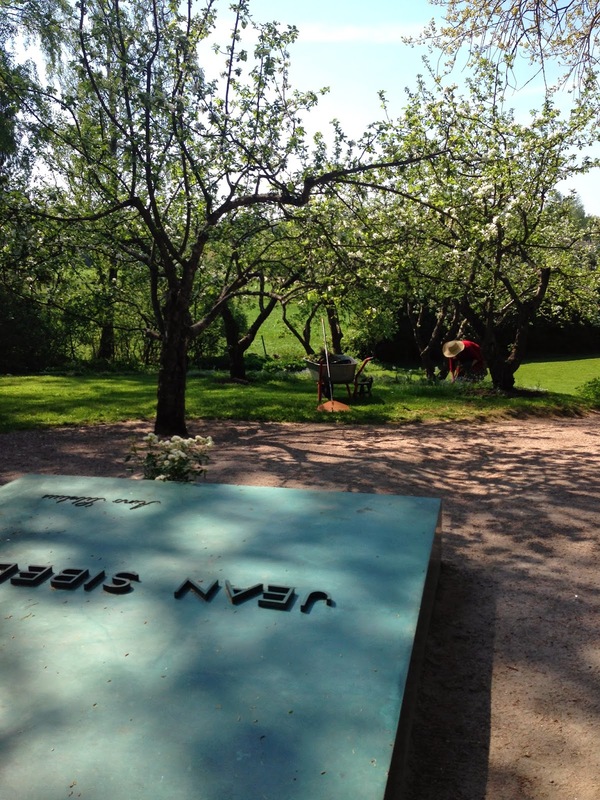 Just a short stroll from the main house is the grave of Jean and Aino Sibelius. It was a simple and perfect resting place. There was a potted rose plant at the base of the stone, and lovely blooming trees all around. 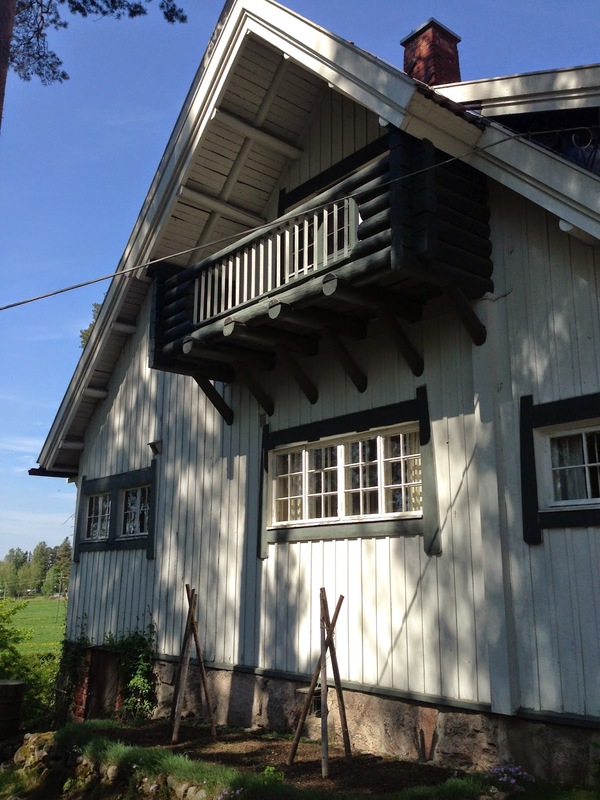 No Finnish home is complete without the sauna, and Sibelius had the best one I've ever seen. Since his house had no running water, the sauna had to serve many purposes. There were three rooms total in the sauna: one for laundry, another for sweating and enjoying life, and a third for bathing complete with a bathtub and shower. The sauna was designed by Aino and she did a wonderful job. We really enjoyed figuring out how the cold water came in from the well and how the hot water came from the stove. There was an interesting system of wooden chutes; possibly very common back then, but now unheard of. It was a great trip back in time into Finnish history. Ainola has a garden behind the house and it was exploding with life since summer weather has just arrived in Finland. There were all kinds of daffodils and wild daisies growing through the grass. 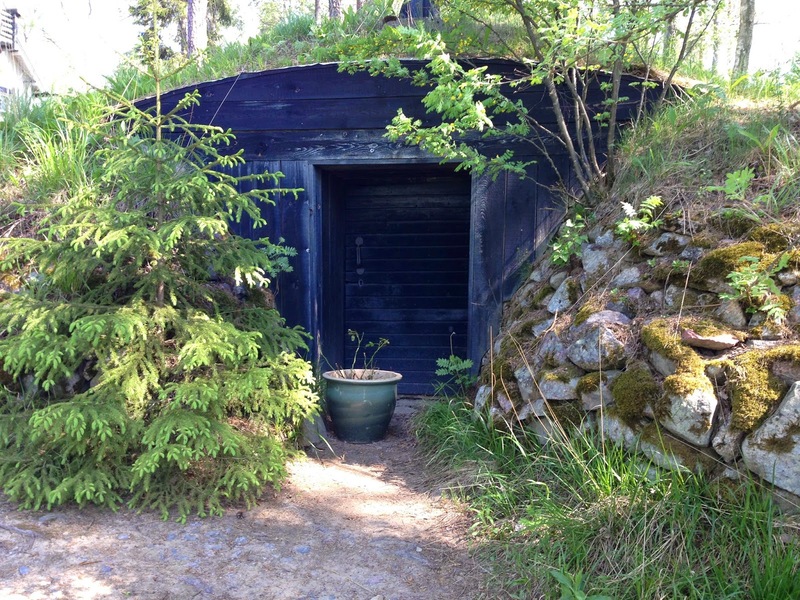 This cellar behind the house reminded me of a hobbit home. So mystical. All of the windows on the second floor had tiny balconies. The top floor was off limits to the public, which made it even more alluring. I so badly wanted to peak through those rooms and breathe in the fresh air from the balconies. I imagine that there is a view of Lake Tuusula from the top floor of the house...but my imagination will have to suffice for now. After Ainola, we took a trip to Helsinki. Since it was such a perfect summer day (and you can never take that for granted in Finland!) we decided to spend the day outside and we went to Kaivopuisto since I had never been. 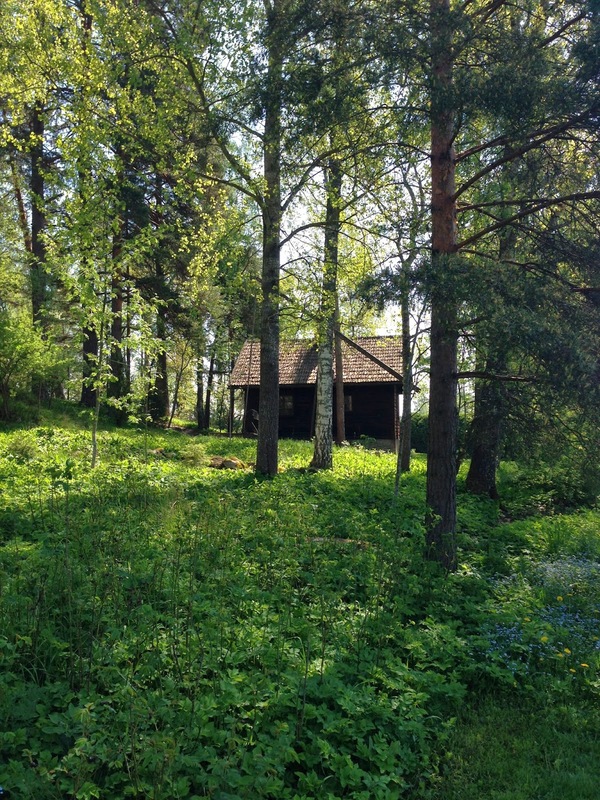 I can't believe that I have been living in Finland for almost a year and I did not know that this park exists! This is my new favorite place in Helsinki. There are beautiful cliffs and hills looking out over the sea. On a clear day you can see all the way to Estonia. Being an appalachian mountain girl at heart, I felt very at home for a moment standing on top of the highest point and gazing off into the distance. What a sight to see: all of the boats in the ocean and the little islands off shore. We stopped at a kioski for Helsingin Jäätelötehdas, which I was told was the best ice cream in Helsinki. I ordered two huge scoops of blueberry and mint chocolate chip and was not disappointed! 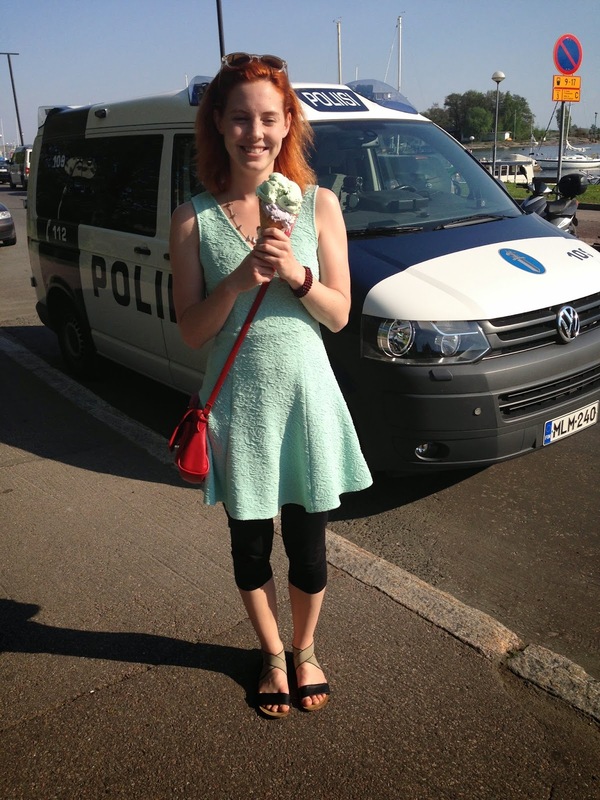 I paid in euro coins from my little change purse, and then spilled my ice cream all over my dress and legs. I felt about six years old and it was amazing! I love this, you have a wonderful blog with beautiful pictures! Ps. The colour green meant F major for Sibelius. This fire place was called "F-duuri-takka"!